Yay! My crazyness is catching onto you guys!!! Belle, ill pretect you with my cuteness! Kirb, hes in our nest!!! Well done Kirby. I like the idea you have of the nest box card. Here is one I use. Thanks Burdluv.. i cannot wait either! 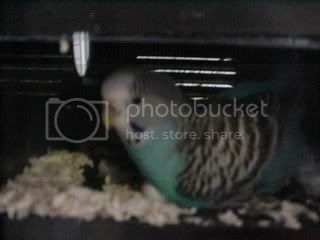 This will be 1st clutch born in my home in 6 tears..
great pics! 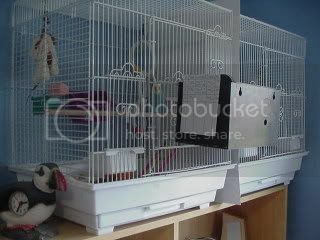 You have the same nestbox as I do!!!! How much did you pay for yours? Mine was $16.99... here in Canada. GUESS WHAT!!!!!!!! 3RD EGG IS FERTILE TOO!!! :P So all you saying first time moms arent always good, Belles beating the odds! 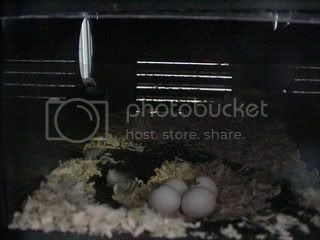 (Laughing out loud) Even thought MANY new moms have good sucess rate(s).... im very happy for her :ausb: Their are 4 eggs now, and 5th egg should be here within next 8 hours... Wish us luck! Mine was $16.99... here in Canada. GUESS WHAT!!!!!!!! 3RD EGG IS FERTILE TOO!!! So all you saying first time moms arent always good, Belles beating the odds! (Laughing out loud) Even thought MANY new moms have good sucess rate(s).... im very happy for her :rip: Their are 4 eggs now, and 5th egg should be here within next 8 hours... Wish us luck! Hey I'm in Canada too...I paid $20.00 for mine :ausb: But it was a new pet store that just opened a month earlier so they're probably cheaper now...Where in Canada are you? Well I hope she did lay another one! It's not getting the ferilte eggs to worry about with new mums it them looking after the babies correctly when they hatch. I'm glad for you Kirby I check egg three tommorrow. Yes i know that, but ive been warned many first timers eggs are mostly clear :ausb: NOT MINE! :P And hopefully not yours! When I happened to look at Skye's vent area, her feathers looked wet :ausb: Why do you think that is? There's like no possible way she can fit in the water dish either...(Laughing out loud)...Unless she REALLY stuffed herself in but i doubt it. in case she lays more it might be an idea to give them the same number or something. 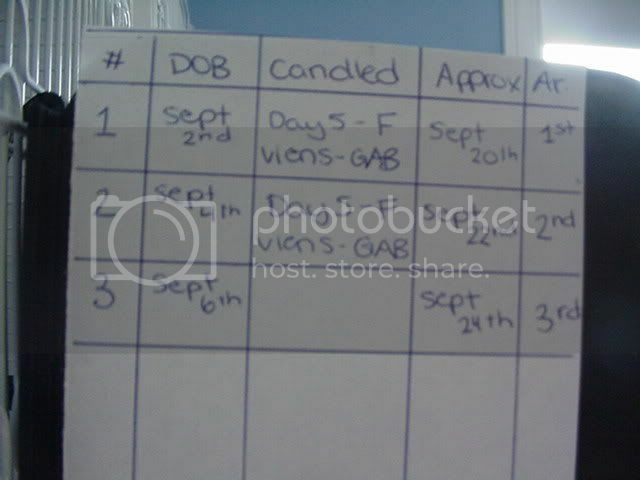 The 4th is fertile Yay im soo excited!!! Im now wondering what i should do. Ariel (other hen) has 5 eggs, all infertile, and have been laid for about 30 days. Shes VERY messy (plumage messed up everywhere, and her hubby Chico is started moutling) both both Chico and Ariel are good to the eggs still (Still sitting on them, Chico feeding Ariel well) so i dont know if since Belles a 1st time mum, to have 6 if not more babies will strees her, if i should put some eggs under Ariel.... I was thinking put the 3 oldest eggs under Ariel so they hatch soonest, then since theres 3 then they will have company in the nest... then Belle will stll have ta least 3 babies, but more if she keeps laying. What do you guys think? Thanks! So exciting Kirby. Can't wait til they hatch. Yes me too!!! Im SOOOOOOOOOOOOOOOOOOOOOOOOOOOOOOOOOOOOOOOOOOOOOOOOOOOOOOOOOO EXCITED! You have no idea! These will be the 1st babies born in my home in over 6 years!!!! when is the first set to hatch for you Kirby?? I would wait until the day before to move the egg, that way if Ariel doesn't get a chance to give up on eggs and chuck them all out including the foster ones.